We made meatballs and marinara sauce the other night. Instead of serving spaghetti, I made some zucchini noodles for my girlfriend. Fast, healthy and delicious plus a good, gluten free replacement for pasta. Cut zucchini into thin ribbons with a julienne slicer or a knife. If you have larger zucchini with big seeds – cut the ribbons down each side to the seeds and discard the core. Toss with salt and let sit for about five minutes. Blot dry with a paper towel to remove any liquid and then add seasoning and toss to coat. Heat olive oil in a large cast iron skillet over medium high heat. 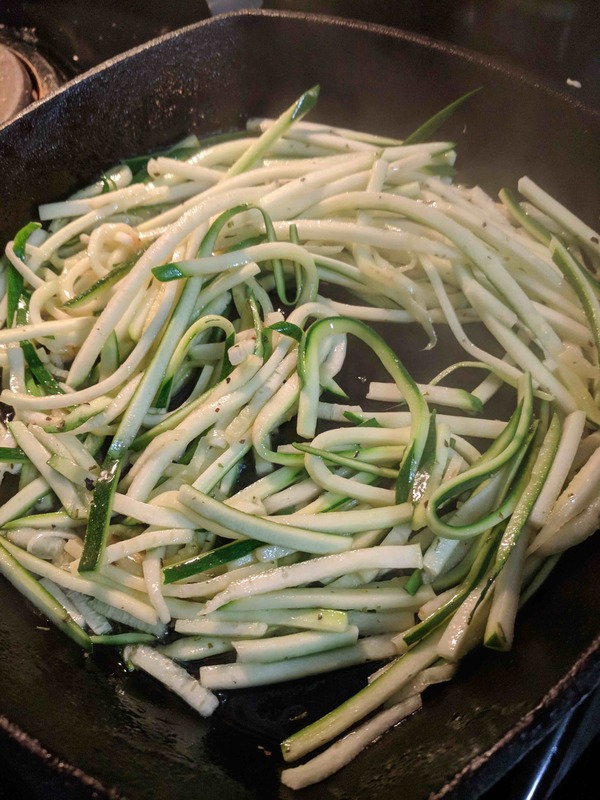 Add zucchini noodles to pan. Cook while stirring for 5-10 minutes or until noodles are at desired level of tenderness. Serve with sauce or as is.